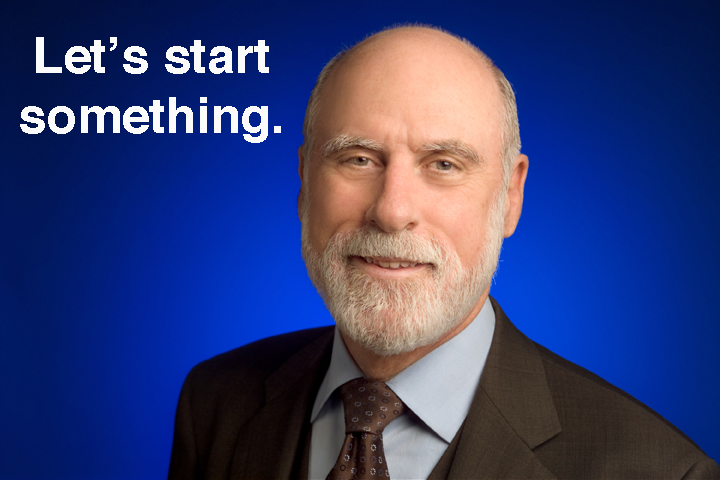 Earlier today, you may have received an odd email from Google’s “Chief Internet Evangelist” Vint Cerf — one of the two people responsible for the creation of TCP/IP technology, and a renowned “father of the Internet” — asking you to help define what the Internet is, and what it should become. 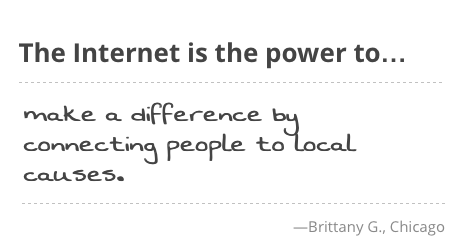 Cerf then asks users to finish the sentence, “The Internet is the power to __________.” This same request is asked on a new Google page entitled “Take Action, Start Something.” There, users can post their theory of what the Internet is to whichever “channel” they like — as long as that channel is Google+, Facebook, or Twitter — along with the hashtag #OurWeb. On Twitter, at least, this corporate attempt to get the Internet talking seems to have worked well, with thousands chiming in about what they believe the Web’s most powerful attributes really are. Skim through the responses, and you’ll find much of what you would expect: The Internet is the power to connect; the Internet is the power to share; the Internet is the power to discover; the Internet is the power to troll without getting caught. At first glance, this whole campaign seems quite odd, and we’ve asked Google to clarify a few things about it. (We’ll update if/when they respond.) But from what we can gather, this is an attempt to launch a proactive campaign to influence federal legislation on the Internet. (At least, that’s our interpretation of it.) It’s an interesting idea, considering nearly all of the online activism we’ve seen so far (think SOPA/PIPA blackout) as been reactive, meaning Washington drafts some dangerous bill, and then the Internet community pushes back against it. It also makes sense that it comes from Vint Cerf, who was one of the most credible and outspoken critics of SOPA and PIPA, and blasted the bill for its potential to damage the Domain Name System and usher in “unprecedented censorship” online. Still, we’d like to know a lot more about what Google has planned for this campaign (the company says it’s just the “first step”), or whether it is simply a “let’s just throw this out there and see what happens” kind of thing. We hope it’s the former — but at this point, who knows?